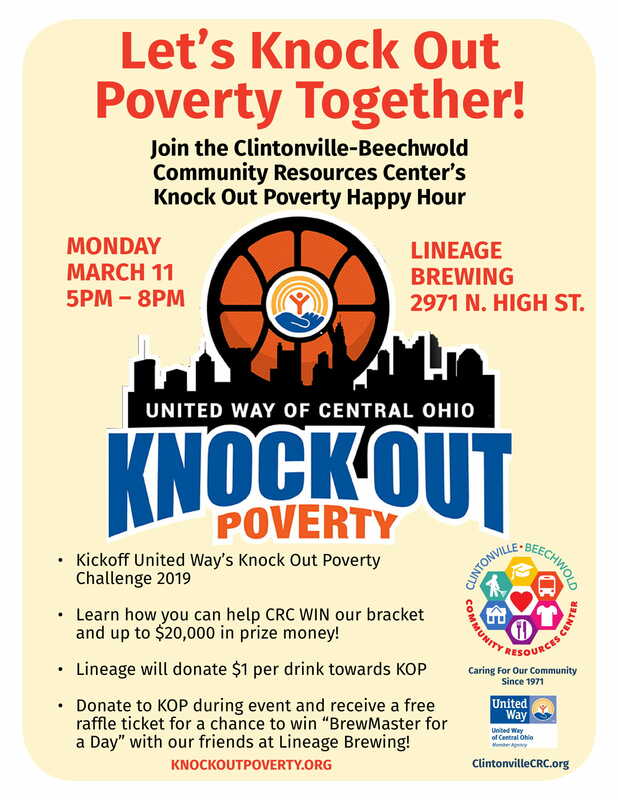 The Clintonville-Beechwold Community Resources Center is excited to be participating in the United Way of Central Ohio’s Knock Out Poverty challenge. This bracket-style competition is challenging UW nonprofit partners to raise money to help knock out poverty in Central Ohio. At the end of the challenge, CRC will receive 100% of the donations we raise! The top organizations in each bracket will also receive tiered prize money. CRC has a chance to win $20,000 in prize money! Note: Donors can start giving through the United Way website on Monday, February 25. The campaign will go live on Monday, March 11. Go to knockoutpoverty.org and designate a gift to the Clintonville-Beechwold Community Resources Center. The top 10 nonprofits who raise the MOST MONEY advance to the second round of their bracket. The top 3 nonprofits with the MOST DONORS will receive prize money. The top 10 nonprofits from Week One will compete again, starting at $0 raised. The top 3 nonprofits with the MOST MONEY receive prize money. Fundraising totals do not carry over from Week One to Week Two, so we will need everyone’s help to get us to the top!